Today being the ninety-eighth anniversary of the repose of St. Raphael of Brooklyn (+1915), here is a pastoral letter he sent out in 1912 regarding relations with the Episcopal Church, mostly likely written on his behalf by Fr. Ingram Nathaniel Irvine. Thanks to Fr. Joseph Huneycutt of Houston for posting it today. Greetings in Christ Jesus, Our Incarnate Lord and God. Two years ago, while I was a Vice-President and member of the Anglican and Eastern Orthodox Churches Union, being moved with compassion for my children in the Holy Orthodox faith “once and for all delivered to the Saints” (St Jude ver. 3), scattered throughout the whole of North America and deprived of the ministrations of the Church; and especially in places far removed from Orthodox centres; and being equally moved with a feeling that the Protestant Episcopal (Anglican) Church possessed largely the Orthodox faith, as many prominent clergy professed the same to me before I studied deeply their doctrinal authorities and their liturgy — the “Book of Common Prayer” — I wrote a letter as the Bishop and Head of the Syrian Catholic Mission in North America, giving permission, in which I said that in extreme cases, where no Orthodox priest could be called upon at short notice, the ministrations of the Protestant Episcopal (Anglican) clergy might be kindly asked. However, I was most explicit in defining when and how the ministrations should be accepted, and also what exceptions should be made. In writing that letter I hoped, on the one hand, to help my people spiritually, and, on the other hand, to open the way toward bringing the Anglicans into the communion of the Holy Orthodox faith. (a) They (the Episcopalians) informed the Orthodox people that I recognized the Anglican Communion (Protestant Episcopal Church) as being united with the Holy Orthodox Church and their ministry, that is holy orders, as valid. (c) Protestant Episcopal clergy said there was no need of Orthodox people seeking the ministrations of their own Orthodox priests, for their (the Anglican) ministrations were all that were necessary. I am convinced that the doctrinal teaching and practices as well as the discipline of the whole Anglican Church are unacceptable to the Holy Orthodox Church. I make this apology for the Anglicans whom as Christian gentlemen I greatly revere, that the loose teaching of a great many of the prominent Anglican theologians are so hazy in their definition of truths, and so inclined toward pet heresies that it is hard to tell what they believe. The Anglican Church as a whole has not spoken authoritatively on her doctrine. Her Catholic minded members can call out her doctrines from many views, but so nebulistic is her pathway in the doctrinal world that those who would extend a hand of both Christian and ecclesiastical fellowship dare not, without distrust, grasp the hand of her theologians, for while many are orthodox on some points, they are quite heterodox on others. I speak, of course, from the Holy Orthodox Eastern Catholic point of view. The Holy Orthodox Church has never perceptibly changed from Apostolic times, and, therefore, no one can go astray in finding out what she teaches. Like her Lord and Master, though at times surrounded with human malaria — which He in mercy pardons — she is “the same yesterday, and today, and forever” (Hebrews 8:8) … the mother and safe deposit of “the truth as it is in Jesus” (Eph.4:21). The Orthodox Church differs absolutely with the Anglican Communion in reference to the number of Sacraments and in reference to the doctrinal explanation of the same. The Anglicans say in their Catechism concerning the Sacraments that there are “two only as generally necessary to salvation, that is to say, Baptism and the Supper of the Lord.” I am well aware that, in their two books of homilies (which are not of a binding authority, for the books were prepared only in the reign of Edward VI and Queen Elizabeth for priests who were not permitted to preach their own sermons in England during times both politically and ecclesiastically perilous), it says that there are “five others commonly called Sacraments” (see homily in each book on the Sacraments), but long since they have repudiated in different portions of their Communion this very teaching and absolutely disavow such definitions in their “Articles of Religion” which are bound up in their Book of Common Prayer or Liturgy as one of their authorities. The Orthodox Church has ever taught that there are seven Sacraments. She plainly points out the fact that each of the seven has an outward and visible sign and an inward and spiritual Grace, and that they are of gospel and apostolic origin. Again, the Orthodox Church has certain rites and practices associated and necessary in the administration of the Sacraments which neither time nor circumstances must set aside where churches are organized. Yet the Anglicans entirely neglect these, though they once taught and practiced the same in more catholic days. In the case of the administration of Holy Baptism it is the absolute rule of the Orthodox Church that the candidate must be immersed three times (once in the name of each Person of the Holy Trinity). Immersion is only permissory in the Anglican Communion, and pouring or sprinkling is the general custom. The Anglicans do not use holy oil in the administration, etc., and even in doctrinal teaching in reference to this Sacrament they differ. As to the doctrine concerning Holy Communion the Anglican Communion has no settled view. The Orthodox Church teaches the doctrine of transubstantiation without going into any scientific or Roman Catholic explanation. The technical word which She uses for the sublime act of the priest by Christ’s authority to consecrate is “transmuting” (Liturgy of Saint John Chrysostom). She, as I have said, offers no explanation, but She believes and confesses that Christ, the Son of the living God Who came into the world to save sinners, is of a truth in His “all-pure Body” and “precious Blood” (Liturgy of Saint John Chrysostom) objectively present, and to be worshiped in that Sacrament as He was on earth and is now in risen and glorified majesty in Heaven; and that “the precious and holy and life-giving Body and Blood of Our Lord and God and Saviour Jesus Christ are imparted” (to each soul that comes to that blessed Sacrament) “Unto the remission of sins, and unto life everlasting” (Liturgy of Saint John Chrysostom). Confirmation or the laying on of hands, which the Orthodox Church calls a sacrament—”Chrismation”—in the Anglican Church is merely the laying on of hands of the Bishop accompanied by a set form of prayers, without the use of Holy Chrism, which has come down from Apostolic days as necessary. Holy Matrimony is regarded by the Anglican Communion as only a sacred rite which, even if performed by a Justice of the Peace, is regarded as sufficient in the sight of God and man. Penance is practiced but rarely in the Anglican Communion, and Confession before the reception of Holy Communion is not compulsory. They have altogether set aside the Sacrament of Holy Unction, that is anointing the sick as commanded by Saint James (see James 5:14). In their priesthood they do not teach the true doctrine of the Grace of the Holy Orders. Indeed they have two forms of words for ordination, namely, one which gives the power of absolution to the priest, and the alternative form without the words of Our Lord, whosoever sins ye remit, etc. (John 20: 23). Thus they leave every bishop to choose intention or non-intention in the act of ordination as to the power and Grace of their priesthood (“Ordination of Priests,” Book of Common Prayer). But, besides all of this, the Anglican Communion ignores the Orthodox Church’s dogmas and teachings, such as the invocation of saints, prayers for the dead, special honor to the blessed Virgin Mary the Mother of God, and reverence for sacred relics, holy pictures and icons. They say of such teaching that it is “a foul thing, vainly invented, and grounded upon no warranty of Scripture, but rather repugnant to the word of God” (Article of Religion, XXII). I do not deem it necessary to mention all the striking differences between the Holy Orthodox Church and the Anglican Communion in reference to the authority of holy tradition, the number of the General Councils, etc. 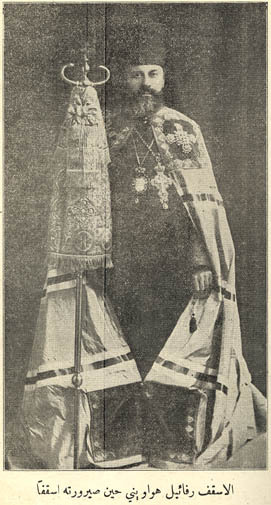 Sufficient has already been said and pointed out to show that the Anglican Communion differs but little from all other Protestant bodies, and, therefore, there cannot be any intercommunion until she returns to the ancient holy Orthodox Faith and practices, and rejects Protestant omissions and commissions. Therefore, as the official head of the Syrian Holy Orthodox Catholic Apostolic Church in North America and as one who must “give an account” (Hebrews 13:17) before the judgment throne of the “Shepherd and Bishop of Souls” (1 Peter 2:25), that I have fed the “flock of God” (1 Peter 5:2), as I have been commissioned by the Holy Orthodox Church, and inasmuch as the Anglican Communion (Protestant Episcopal Church of the United States) does not differ in things vital to the well being of the Holy Orthodox Church from some of the most arrant Protestant sects, I direct all Orthodox people residing in any community not to seek or to accept the ministrations of the Sacraments and rites from any clergy excepting those of the Holy Orthodox Catholic and Apostolic Church, for the Apostolic command, that the Orthodox should not commune in ecclesiastical matters with those who are not of “the same household of Faith” (Galatians 6:10), is clear: “Any Bishop; or presbyter or deacon who will pray with heretics, let him be anathematized; and if he allows them as clergymen to perform any service, let him be deposed” (Apostolic Canon 45). “Any bishop, or presbyter, who accepts baptism or the Holy Sacrifice from heretics, we order such to be deposed, for ‘what concord hath Christ with Belial, or what part hath he that believeth with an infidel? '” (Apostolic Canon 46). Commending our clergy and laity unto the safe-keeping of Jesus Christ, and praying that the Holy Spirit may keep us all in the truth and extend the Borders of the Holy Orthodox Faith, I remain.